The readers of this blog know that my favorite topic is our very large national debt, now 77% of GDP (for the public part on which we pay interest) and predicted by the Congressional Budget Office to keep steadily getting worse, without major changes in current policy. 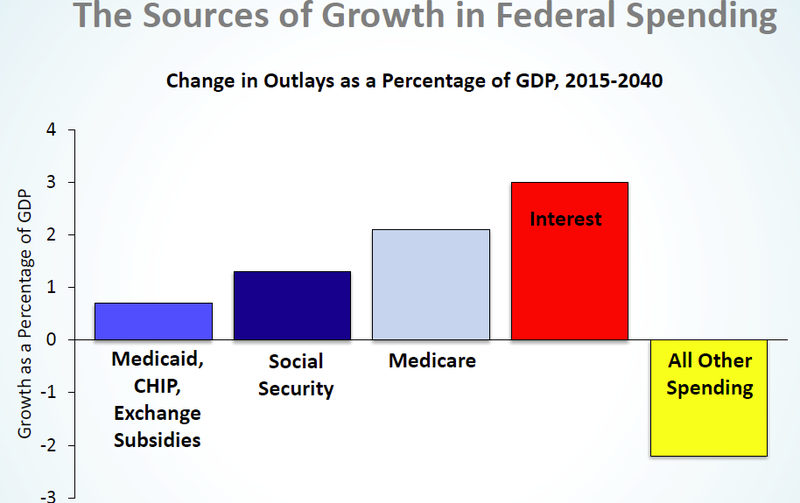 It is also well documented (see chart) that our entitlement programs of Social Security, Medicare and Medicaid are the drivers of the huge annual budget deficits which make the accumulated debt so much worse and worse. FDR who persuaded Congress to repeal unjustified disability entitlements to 400,000 WWI, Philippine War and Boxer Rebellion veterans. Bill Clinton’s welfare-reform plan not only reduced welfare’s burden on taxpayers but also benefitted the recipients, whom the old program had been harming. Significant agreement among the general public and the elected representatives that there’s a problem. Bipartisan consensus on the solution for correcting the problem. Conclusion. Think about it. This is a quite a gloomy assessment. Nothing will get done on the primary reason for our huge debt problem without both presidential leadership and bipartisan political support. When is this going to happen? This entry was posted in entitlement reform, entitlement spending, entitlements, Jack Heidel, John Cogan, Medicaid, Medicare, Social Security, Uncategorized, Wall Street Journal and tagged debt, deficit, Deficit spending, entitlements, fiscal responsibility, jack heidel, John Cogan, Medicaid, Medicare, Social Security, Wall Street Journal by jackheidel. Bookmark the permalink. Maybe we should think more about what programs should work from the profit motive and which ones might be seen as a public service. The former premises self-interest, and the latter draws from sharing and cooperation. Isn’t it time to have a discussion on capitalist and socialist principles? Of course, both are flawed and both have advantages. When do we think of leveling and when of distinct class lines? Human motives have to be examined before we can establish a clear set of principles to be followed with programs or social and economic action. In short, I think the basic debate has not been closely argued publicly or privately. I would say that the American economic and governmental system involves both capitalistic and socialistic principles. Our free enterprise economic system is capitalistic and our governmental programs, especially the safety net, is socialistic in nature since it redistributes from the more fortunate to the less fortunate. Here is where we would find strong disagreement. God or the Devil is in the details. For instance, over the past three decades or so, we have been inundated with so much evidence indicating the wealth of the .01 percent as distinct from the remainder of the country. In particular, I find a great disparity in the health and education institutions. What assures that continuation is the Supreme Court Decision giving corporations more say at the ballot box. Free universal K-12 education has been provided in the U.S. for at least a hundred years now. Most states, including Nebraska, provide state aid to make sure that resources are relatively equal across districts. For example, OPS (a poor district) spends approximately the same amount per student as does Millard (a wealthy district). After the failure of Congress to repeal and replace the ACA this past summer, we are now on the way to provide universal healthcare in the U.S. I would say that the U.S. has a relatively high quality of life because our median family income is the highest in the world. This whole topic might make for interesting discussion in our Examined Life group at church. Yes, it would. I don’t know how to copy these messages. If you can and make a few copies to hand out that would be fine with me. I’ll send this post, along with our comments, out to the members of our study group.